It’s hard to believe that we are officially 4 weeks away from Christmas, I’m over here begging for time to slow down a little bit as my not-so-little one is growing leaps and bounds before my eyes but also super excited for all of the holiday events and activities we have worked in as family traditions. A big tradition for us, and one we try our best to knock out in November is.. you guessed it, Santa photos! 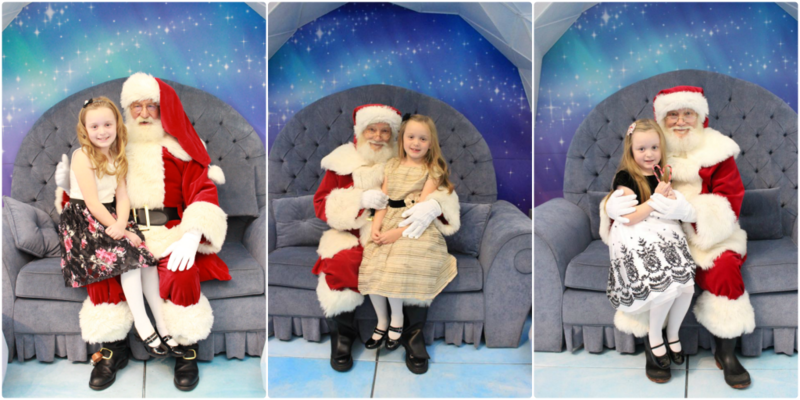 We’ve been going to Metropolis at Metrotown for our Santa photos for the last 6 years, I can’t believe we already have so many Christmas’ behind us, but we’re super thankful for the memories we’ve made. 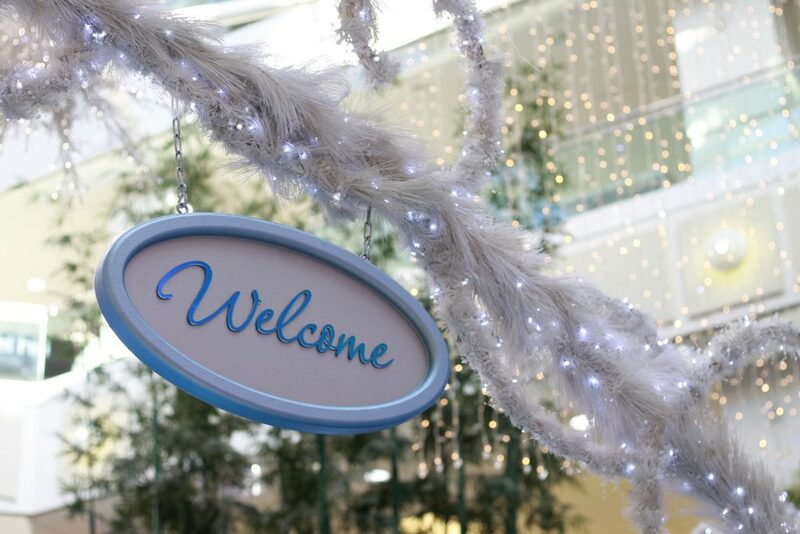 There’s a few reasons we’ve been going back to Metropolis at Metrotown over and over again, it isn’t the closest mall to us by a long shot but they continue to win us over every single year with their dazzling Winter Wonderland display and one of my favourite things – their charity involvement. 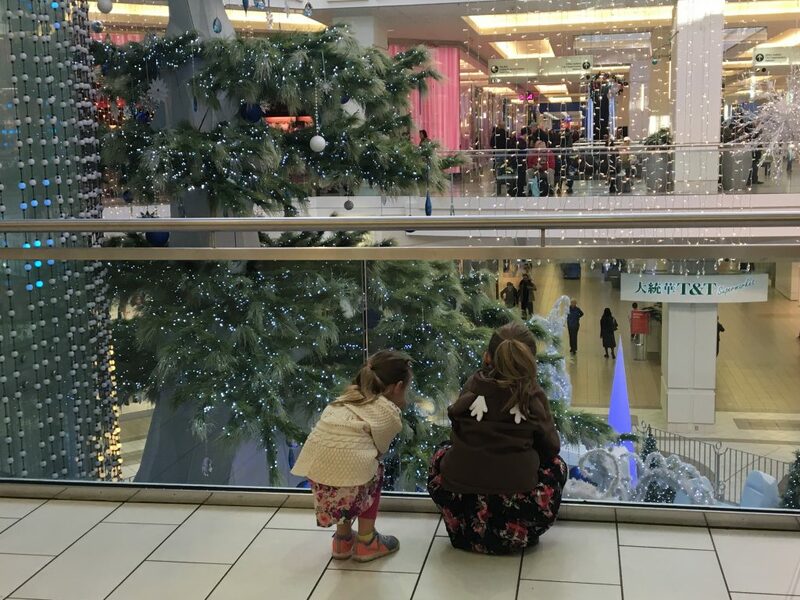 Unlike other malls, Metropolis donates 100% of the Santa photo proceeds directly to the Burnaby Christmas Bureau, those are the wonderful people who make the holidays happen for families in need. From groceries, necessities and holiday gifts, every single photo you donate for is directly impacting someone’s life. That is a huge draw for our family and we usually donate a bit over and above for our photos because we know it’s going to a great cause. Recommended donation is $3 a photo and the photos are delivered digitally for you to print wherever you’d like and to share on social right away. Santa is a busy guy around this time of year as I’m sure we all know, to avoid disappointment we highly recommend stopping by for photos outside of peak times to avoid large wait times (Click here for Santa’s hours!). Once you make it through to the registration area there are some fun interactive games to get the kids through the last stretch though. Kids also score a free candy cane + a kids size cone from Dairy Queen for their patience which makes the line standing a bit more tolerable, just in case it’s a bit busy. If you want to double up on some charity giving, make sure to bring your purchases over to the Gift Wrapping for Charity station, you get to skip wrapping and proceeds benefit the Burnaby Neighbourhood House and MS Society of BC/Yukon. You can find the stations in front of The Disney Store on the ground level and in front of Plenty on the Upper Level. The stations will be operating by donation starting November 23 to December 24. That’s a big enough reason for me to continue getting our photos done, but I swear, each year Metropolis kicks it up a notch and brings in new and improved services that aim to make mine, and your, holiday shopping experience a bit more enjoyable all around. 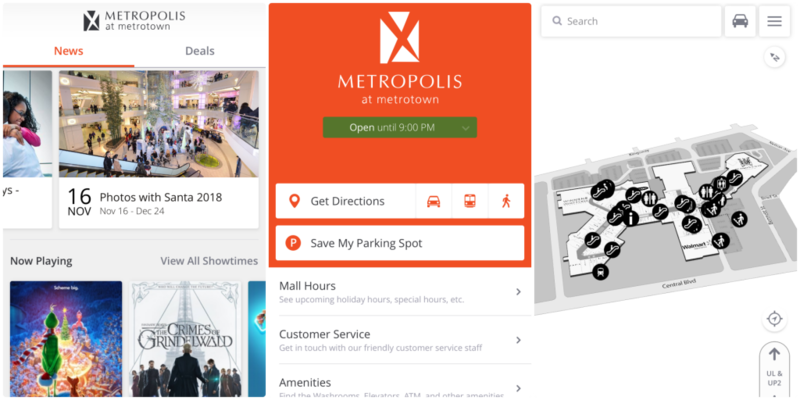 Guests can now enjoy the state of the art Metropolis at Metrotown app that highlights upcoming events, gives you access to deals (and you can save them! 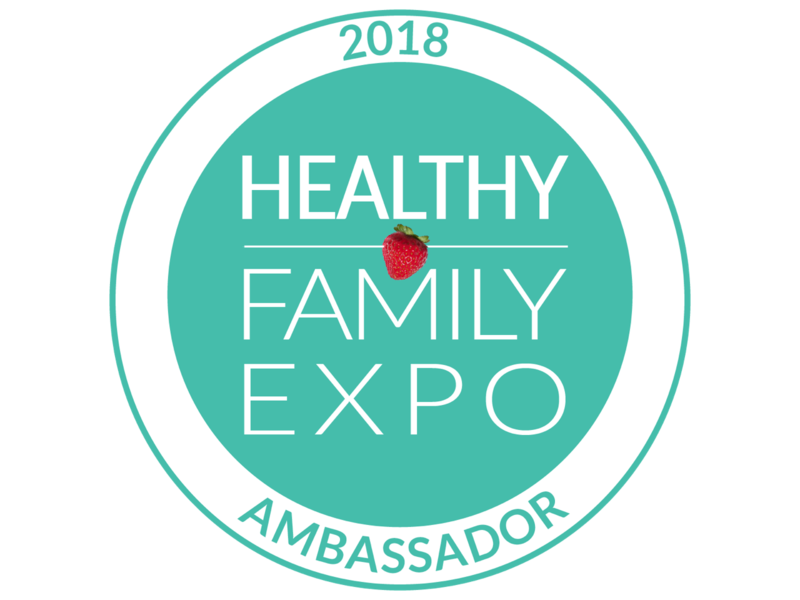 ), you’ll find around the mall, check showtimes for the theatre, read up on news and mall announcements oh, and probably the best feature ever? There’s a place to put where you parked. Funny story for you, last year a friend and I hit the mall for some serious kid free shopping time and promptly lost my car in the parkade. You can bet I’ll be making use of that feature! Oh, and let’s not forget the interactive map if you get turned around all the time like I do, want to check your gift card balance? Find a washroom? Your favourite store? This app has it all! While I absolutely love the new app, if the app isn’t a you thing (that’s totally fine, my phone is bordering on super full over here too!) then you can STILL find all the deals online on the Metropolis at Metrotown website, so don’t miss out on those. 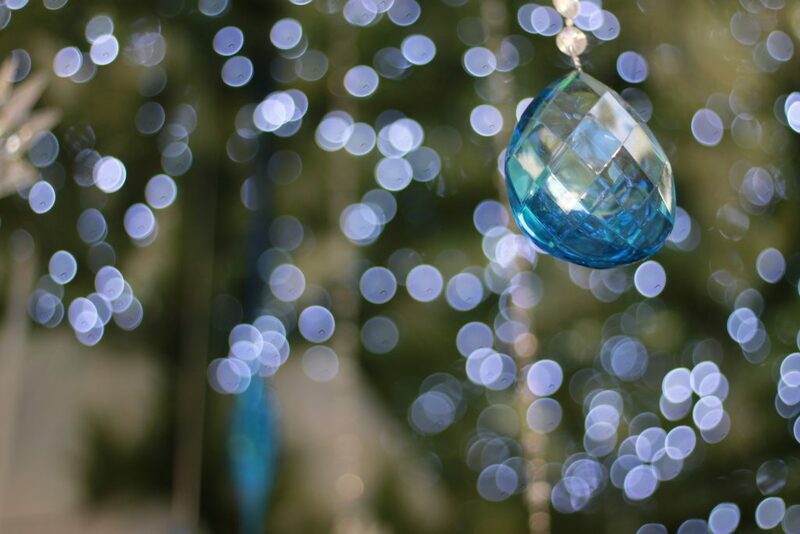 There’s a ton more happening this holiday season to make things more smooth all around. Holiday hours anyone? Yassss! That all sounds pretty magical right? I wasn’t kidding when I said they were kicking it up this year. Now, instead of hunting down a customer service kiosk (though the app makes them easy to find) you can just whip out your phone and text the new Customer Service line and someone will respond within 60 seconds. 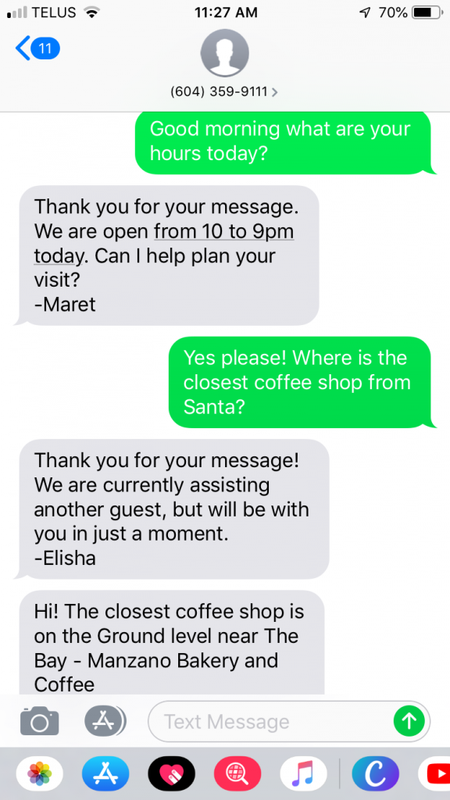 I had a bit of fun testing it out and found the closest place to get a cup of coffee after Santa photos and was super impressed at how quickly they responded. You can use this service during mall hours, need help finding a store? Curious about mall hours? Need help with parking, a children’s stroller or anything else store related? Save 604-359-9111 in your phone and you’ll thank me later! I’m counting down to Christmas and one of the things on my list for a family member is a Metropolis Gift Card! They’re redeemable at 23 Ivanhoe Cambridge shopping centres around Canada so they really are the perfect gift for that hard to shop for person in your life. The cards are redeemable throughout the mall from food, clothing, accessories and more. Want to grab one? 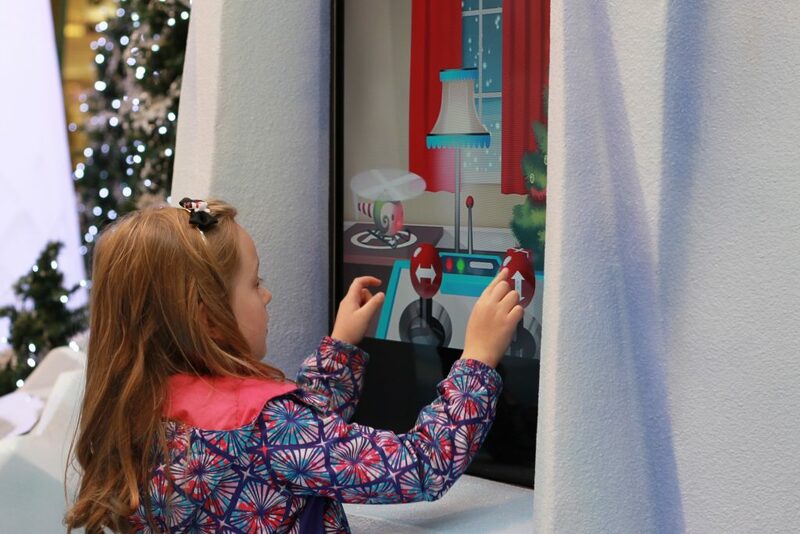 Hit up one of the dedicated holiday gift card kiosks or grab yours online at www.metropolisatmetrotown.com. All in all, Metropolis is our go-to all year round but we definitely spend a lot more time there during the holidays. They have so many of our favourite shops under one roof, tons of parking (no really, but I’m not sharing where I park! lol) and a great customer service team. I have a few more gifts to head back for and may sneak in a mom photo with Santa if I can catch him when it’s not busy! Whether you’re stopping at the mall for yourself or a loved one this holiday season, make sure to take a few minutes to soak up all the holiday decor, music and vibes. I absolutely love the decorations at Metropolis and often find myself just wandering around with a cup of coffee while A is at school. There’s no shortage of things to do and see, so we hope you’ll stop by to say hi to Santa and get some of your holiday shopping out of the way early with us. I love that they are giving money from the Santa pictures to charity!! That is awesome because they have one of the best displays in the city. its great that the Santa and layout is so detailed and festive and that helps so ma y others in need. Their new text option for customer service sounds fantastic! So many stores all in one place! I love their late hours at Metrotown and also the fact that I can do my grocery shopping after regular shopping makes it so much easier for me! Having a place to record where you left your car – genius!! Love that the money from Santa pics goes directly to charity! The app sounds amazing and as much as I am not a mall goer, this app sounds like the thing to have if you are hitting up Metropolis at Metrotown. Also how awesome is the text service! This mall has everything you need to complete your Christmas shopping!! I just used the texting last Sat and it was a miracle!!! I loathe crowds but this kept my sanity! I absolutely LOVE that they give all the proceeds from santa photos to charity. What a great thing to do! Donating the proceeds of the Santa photos to charity is a wonderful way to give back! Slip out and get a little shopping done expecially once the mall.starts to die down and isnt likely to be as busy! Love the new app! No more losing the car!!! Love that there is truly something for everyone at metrotown! Metrotown has all the stores I need to do my shopping and now with Walmart it makes my life even easier! Their new app is a game changer for that mall! It makes such a difference. I love Metropolis at Metrotown. Makes shopping easy anytime, but especially during the holidays because it’s a one-stop shop! They have all of my favourite stores! I love how you can text someone and someone can get back to right away. Saves times looking for someone and lining up! Hey dude. I love how Metrotown has the Disney store and how I can get star wars stuff there too. For all the nerds on my list lol. I love their new app! That will definitely make shopping at such a large mall easier during the Christmas season! While I have an amazing memory for where I parked, I know my husband could use the app! Lol! Love the giftcard they have! One card that works so many stores at Metrotown makes gift giving less stressful! This huge mall has all the department stores and small shops that I need and so I don’t t need to go anywhere else! I love the interactive games for the kids lining up! It’s a great way to distract them and keep them with you as you get closer to Santa! I love that you can text customer service to ask where to find a store! Metrotown has pretty much everything for everyone. You go there and come out with the tree and gifts, food etc!! Amazing place to shop! Can’t wait to take my kids to see Santa! Such a WONDERFUL thing to do!! LOVE it! I love seeing all the things that you do and let us know early what’s happening around town. I also love seeing all the photos of your daughter and the great things she gets to do with you! We can’t wait to visit Santa! I need to get my kiddo in to see him soon!! I absolutely love that they have all the stores I need in one place – that makes things much less stressful! 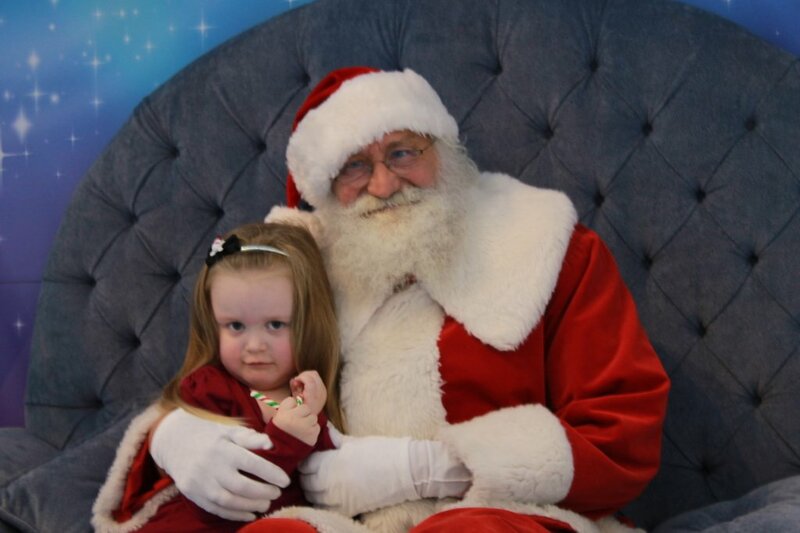 Plus my daughter loves to see Santa every time we go! The app is really helpful and your post is even more than helpful. Thank you. That app!!! Would definitely make ALL my visits to Metrotown less stressful — though it won’t give me as much exercise walking around to find the next map kiosk, LOL. metrotown has all the stores i need to do my Christmas shopping! I am looking forward to trying the new app. I think it will help make shopping less stressful, hey it even has a place for where you parked. Offering Metropolis Gift Cards that are redeemable at 23 Ivanhoe Cambridge shopping centres around Canada makes shopping way less stressful. You can’t go wrong with a Gift Card! I think the text the new Customer Service option offered by Metropolis is going to make holiday shopping less stressful. We didn’t get a chance to use it while visiting Santa last weekend. Metropolis makes my shopping less stressful because it is close to home and it has all the stores there! The extended hours and the car tracker are very attractive to me! 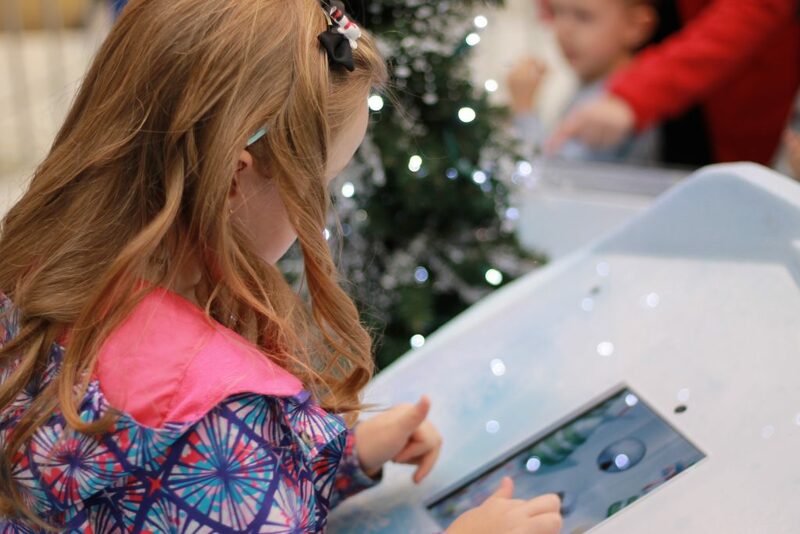 I think the app is going to make holiday shopping at Metrotown so much easier! I would love to be able to get over there to have my Son’s picture taken. We had it done when he was 7 1/2 months old and just haven’t got back over to the Mainland to have it done again. Loved the setup! I’m so happy that they have games to entertain the kids waiting for Santa! My son is so impatient and hates to wait! I need that car finding function! 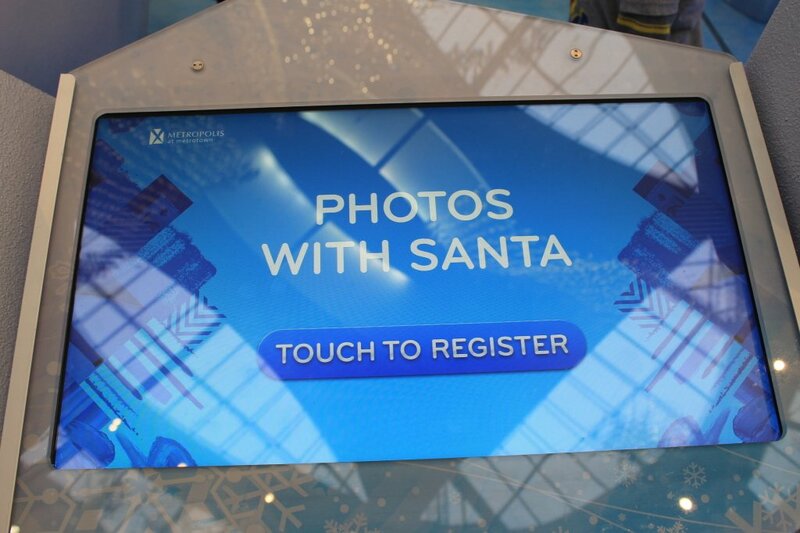 I think it’s great that Metropolis has an app to schedule pictures with Santa! I love the interactive map. Supporting Charity is an incredibly generous notion! Donating 100% of the Santa photo proceeds directly to the Burnaby Christmas Bureau is awesome. Metropolis at Metrotown makes shopping convenient with their extended holiday hours and useful app!!! I really like their app! The app to use while shopping, just for the location map alone would make my shopping there so much easier. I get so turned around in that mall. Shopping is so much easier when everything you need is close together 🙂 Merry Christmas ! The Metropolis at Metrotown app is awesome! I hate always looking for the maps and/or service desks! I love that they are doing this. Every mall should! love that the mall is open late and is easier to shop. Extended hours and lots of stores. EXTENDED HOURS, THE APP AND THE DISNEY STORE!! Metrotown is the best! I love that they have free parking & extended hours! My favourite way that Metropolis is making holiday shopping less stressful is that there is a store there for everything you need so it takes the stress out of running around to different places for all those special people on your Christmas list. I love that they donate money to charity from the photos they take with Santa. That is heart warming and good to know. Extended holiday hours make christmas shopping less stressful!! Metrotown’s Christmas decor and display are always so beautiful. I didn’t know about the app but it sounds so useful! I’ll have to remember to download it because I already know I will be making a few more trips there before the year is over! One of the few places you could all all your shopping in one place. It’s so great having so many stores in one place. I can pick up a present for everyone on my list! 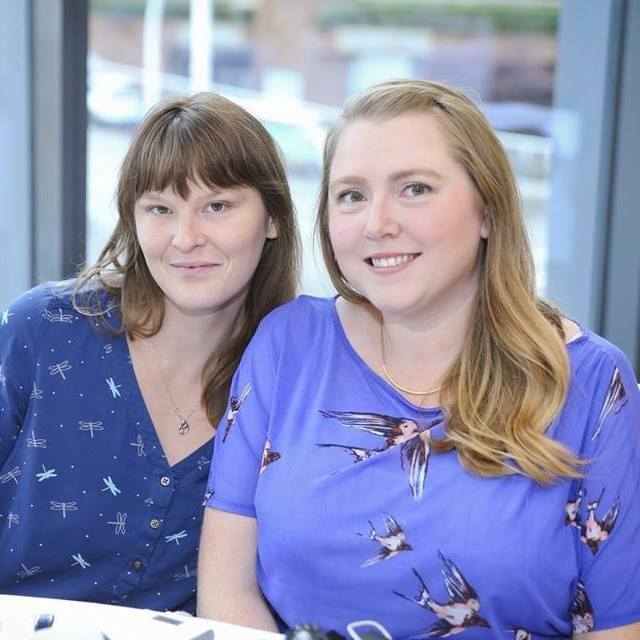 My favourite is the extended shopping hours – it means I can shop without the kids once my husband is home from work, and I am a night owl who perks up at night, so I’d be able to be bright eyed while getting my last minute shopping done!! I also love that I can put where I parked my car on the app!! Sometimes after hours of shopping it’s hard to remember!! Especially at busy times of the year when my normal go-to spots may not be available and I end up parking somewhere different than my usual spot(s). I love how the mall is a 1 stop mall . With everythimg from food to clothes and toys! I do alll my shopping there!! I love how its decorated. Makes it feel so festive and gets you into the Christmas spirit!! I’ve never done Santa photos at Metrotown before because it’s so crowded in general at that mall, but it really sounds like they’re kicking it up a notch and might make it worth the trip! I love how many stores are available in the mall. Sure makes ticking all items off my list easy! Many great stores at Metrotown and great holiday hours too! Extended hours make Xmas shopping so much easier! I love everything about the app! getting in and out as quickly and efficiently as possible is hugely important to me, especially at Christmas! My favourite way Metropolis is making holiday shopping less stressful is extending shopping hours for late shoppers like me! Wow – that text customer service is amazing! I haven’t been to Metropolis for a while, it’s time to visit! Metrotown has always been my go-to mall. Especially around the Christmas season it’s a one stop shop, with all the stores I need, Santa, food & of course pretty decorations! I like the text option for customer service! I love that they have extended hours and lots of stores to choose from. One stop shopping and gift wrapping! Love it! The texting customer service is a great idea! I can think of many times in the past I could’ve used it and I’m sure I will soon!